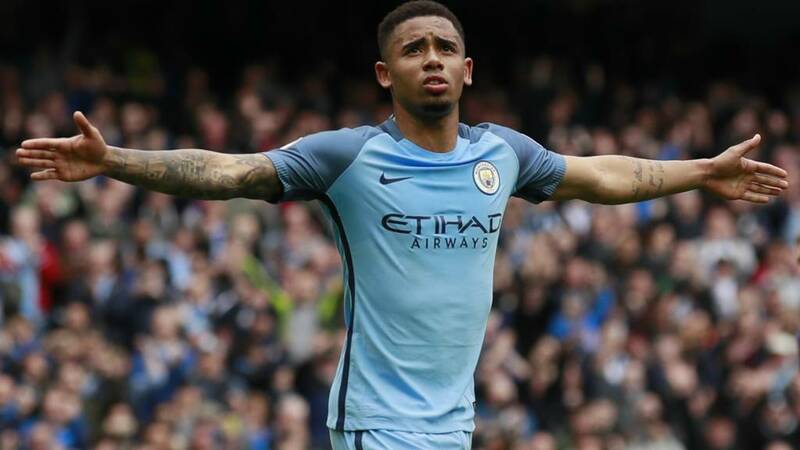 So, Manchester City are looking good for a Champions League finish after a controversial win over Leicester City. They're up to third with two games to go and could, mathematically, still pip Tottenham to second. Many thanks for your company. Don't forget you can keep up to date with the rest of today's game here. Manchester City boss Pep Guardiola speaking to BBC Sport: "I must congratulate Chelsea, the last champion was Leicester - the last two or three months with their results they would be in the Champions League positions. That's why I have a lot of value in this victory. "In the second half we don't know if to attack or defend the result - it's not easy. We're playing for the club to be in Europe and that's why it's not easy to play these games. "If we win against West Brom we will be mathematically in the fourth spot. if we can finish third that is the point. "I am was so happy with the guys in the club, I feel a lot of support from everybody. The human beings we have are amazing. We have the regret of not fighting for the title until the end - but we will improve." Manchester City manager Pep Guardiola speaking to Sky Sports: "We have two games left and it was so important - against the last champions. When you play against them you understand why they were champions. "In the first half we were good and it was a shame to concede an amazing goal. Everything happened in the last 10 minutes. "It's not easy to win games in a row. Now we rest for Tuesday. On the first goal: "I don't know if Raheem touched the ball. The referee's never spoken about that. He's in his office, you can go and ask him. When asked if the referee did well to spot Mahrez's double touch for the penalty: "Well done. It's the first or second time I've seen that in my life. We have to look after our boots." On the top four: "We need one more game to be in the top four but it's in our hands. West Brom will be tough but hopefully we can be better than today. And we go to Watford." Leicester City manager Craig Shakespeare on Man City's first goal: " Once he makes the play of the ball, he becomes active. It should have been offside. He's really trying to block Christen too. On the disallowed penalty: "To the letter of the law it's a double touch, but he could bring it back for an encroachment from Manchester City so there's a bit of injustice. It's bad luck from our point of view. Two City players were in the penalty box. "I'm pleased with the way we went around it in the second half. To get our goal, it was a quality goal. "They're getting every last drop out of themselves. We want to finish as high as possible in the league. The spirit and determination was there for everyone to see." Manchester City are back in action at Etihad Stadium on Tuesday when West Bromwich Albion are the visitors (20:00 BST). Leicester host Tottenham next Thursday (19:45 BST). Leicester City boss Craig Shakespeare, speaking to BBC Sport: "As soon as the Manchester City player Sterling makes an effort for the ball he becomes active." On Leicester's failed penalty: "I didn't see it at the time. It's a freak thing you don't see often." On the game: "We threw everything at Manchester City in the second half - you you saw from the players the spirit they showed." On his future: "I've stated my contract is until the end of the season. There is only two games left. Everyone will find out soon." Manchester City midfielder Yaya Toure: "It was difficult. We controlled the game after the first goal and got the penalty. But when they scored it was quite difficult but at the end of the day we are delighted with the win. On Leicester's disallowed penalty: "I was right behind him and you could see him slip. You are unlucky sometimes. I was delighted for us as I thought it would be harsh. To win the game was very important." Leicester City keeper Kasper Schmeichel has spoken to BBC Sport about Man City's first goal. Raheem Sterling was in an offside position when he stretched for the ball, but did not make contact as it went in. Schmeichel said: "The Man City player is in an offside position and the ball is struck. The ball goes across him, which prevents me seeing, and he's stood in front of Christian Fuchs and he also goes for the ball - so it's three times offside. "If he's in the six-yard box he's influencing something in there. I think the rule needs to be looked at. He might be onside and get a flick on it and I have to take that into consideration." It's Yaya Toure's 34th birthday today, so Sky Sports ask him about his future. "I think my future is all about Tuesday's match. We have another game then. You don't know what's going to happen in the future. I appreciate playing and age is only just a number. I feel younger than Raheem now. I hate birthdays." As Raheem Sterling presents Yaya Toure with his man of the match award, Sterling turns and says 'happy 38th birthday'. Cheeky. Leicester City goalkeeper Kasper Schmeichel, speaking to Sky Sports: "The first goal was definitely offside. He is blocking my view. It's one of these debates I'd love to get involved in but we're not allowed to. He's in the six-yard box and he is interfering because I cant see ball." Manchester City forward Raheem Sterling, speaking to Sky Sports, on City's penalty: "David shot and I realised if I touched it then it would be offside. I wasn't worried because I knew I didn't touch it. It's a massive win. There's been times throughout the season when I felt we deserved more but didn't get any luck. Today we got the luck." Leicester must have had words at half-time - they were poor first half. In the second half it's like what we saw from them last season. I believe the four at the moment will be the top four at the end of the season. On Riyad Mahrez's penalty being disallowed: It was a good spot from the referee. The Manchester City players reacted - you feel sorry for Leicester, but it's a massive three points for Man City, they looked edgy though." First half, Manchester City were the better team by far and should have put the game to bed. Leicester were different class second half and probably deserved a draw in the end. It's all over! Manchester City climb above Liverpool into third spot. Expect to hear lots more about Riyad Mahrez's controversial failed penalty attempt. Leicester free-kick deep inside the Manchester City half. Kasper Schmeichel is up for it. This has been a decent second half effort by Leicester City. The home team are trying to eat up as many seconds as possible and Pep Guardiola is urging the referee to blow his whistle. Jesus Navas adds a fresh pair of legs to Manchester City's team. Gabriel Jesus appears injured as he makes his way off. This has been a real bruiser and Nicolas Otamendi will finish the match with a bandage wrapped round his head. It's very Terry Butcher...without the blood. Pep Guardiola can't stay in his seat. He's prowling his technical area as the fourth official signals seven minutes of added time. This game might just finished before the 15:00 BST games!